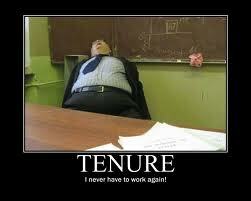 How most people view teacher tenure. I came across this video a while ago about the 3020a process here in NYC. This is the process that a teacher accused of wrongdoing has to go through that decides whether or not they keep their license. Among the members of this discussion is Betsy Combier who runs the NYC Rubber Room Reporter blog that can be found on my blogroll. I found myself paying particular attention to Michael Mazzariello (Judge Mazz of Street Court), who was a former prosecutor for the old Board of Education. This means he was the guy that went after teacher licenses. Not only that, he did his work back in those days when tenure supposedly meant a job for life. Listen to what this man says and how easy it was for him to remove incompetent teachers. He is rational and makes perfect sense in this discussion. They all bring up interesting points about the pros and cons about the teacher termination process. Much has changed about 3020a since this discussion took place but it is still relevant. Tenure means a guaranteed job? No. It means due process. While there were always problems with it, the answer is not to get rid of it. This entry was posted in An Embattled Career, education reform, School and tagged 3020a hearing, Due Process for Teachers. 3020 hearing, education, Education deform, Education law, Judge Mazz, Myths of Teacher Tenure, Teacher Tenure. Bookmark the permalink. Excellent video with refreshing honesty for a change. Sorry, wordpress has a tendency to spam comments undeservedly. This is my lawyer in this video…and my wonderful friend Betsy.